As an old city that is, Madrid has many curious things. Some little known even to the locals. We tell you some of them. So you can plan a good visit. – The Royal Palace of Madrid is the largest in the western part of Europe. In fact, it is greater than Buckingham’s. 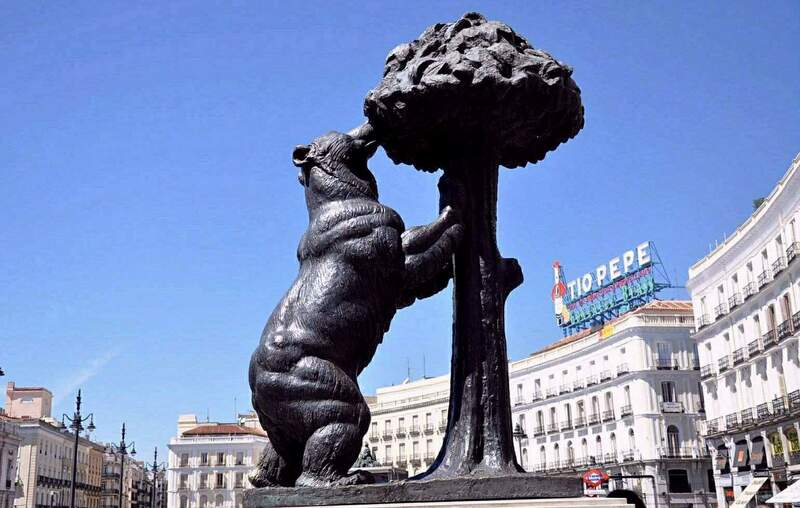 – The sign of identity of Madrid is the bear and the “madroño”, but really it is not known why. The most accepted is that in the area there were “many madroños” (a type of tree) and bears. But the truth is that nothing is clear. – The longest street in Madrid is Alcalá, with almost 10 km. and the shortest one Rompelanzas with only 20 meters. – In the metro station of Tirso de Molina were found the skeletons of monks from an old monastery. Some say that at night their cries can still be heard. – Once a newspaper, El Liberal, published the news that our famous Prado Museum had burned down. Evidently an incredible commotion arose due to this, but fortunately everything was a false alarm. – In Madrid you can visit remains of the Berlin Wall, specifically in the Berlin Park. – In Madrid it is a ritual to go to El Rastro on a Sunday morning. But few people know the origin of this name. It is because there were many slaughterhouses in this area and it was common to see traces of the blood of the animals on the ground. – Puerta del Sol is the “kilometer 0”, which is the point of reference to measure distances to all parts of Spain. – The persons born in Madrid have a nickname: “gatos”. This name seems to be that it comes from a soldier who during the reconquest of Madrid climbed the walls of the city. According to this legend, King Alfonso VI saw him and said “it looks like a cat”. – The narrowest house in Madrid is on Calle Mayor, very close to El Anciano Rey, and it was the home of our writer Calderón de la Barca. In other post, we will tell you some more curiosities. Meanwhile, you can always come to enjoy the atmosphere of a typical tavern in Madrid in El Anciano Rey de los Vinos.